Alert! Have you been sent a cheque from a person claiming to work for a mystery shopping company? These are fraudulent! Click here for details. Successful companies know that Businesses Intelligence is essential for sound decision making. PerformaLogics Inc. works with large and small companies, gathering critical intelligence to make sure that the decisions they make are timely, relevant and accurate. 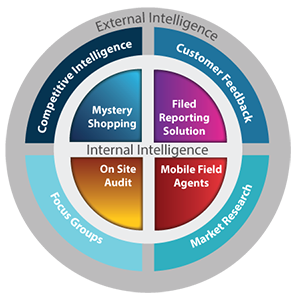 Whether your organization is looking to gather internal intelligence such as adherence to policy or external intelligence such as customer experience or market evaluations, PerformaLogics has the tools and expertise to support you. Using our mobile reporting solutions or through our own mobile field agents, we can provide you with reliable field reporting, customer feedback, mystery shopping, competitive intelligence or market research solutions. PerformaLogics provides superior expertise, years of experience, and advanced technology to design, implement and manage your project and report valuable and critical information back to the decision makers in real time. PerformaLogics and our team possess decades of experience. We have a proven track record and work with numerous organizations from diverse markets, from single location businesses to multi-facet national and international organizations. Best practices and sources coupled with industry leading data validation and quality assurance procedures makes PerformaLogics the right choice when you need actionable intelligence about your business. We have the ability to gather information from multiple sources and tie it all together, making sense of it and turning that information into intelligence that is delivered to you in easy to understand and actionable terms, providing your organization with the information you need to make sound, strategic business decisions. Contact us to find out how PerformaLogics can provide your organization with a sound and cost effective business intelligence or research program. If you are a client or a Mystery Shopper, click one of the login buttons above to access your account. I am a business enquiring about services. I am a person looking to work for PerformaLogics. I have seen many of these surveys in my 40 years in business, but never ones as well done as these. The attention to detail, the thought process put into the questions and the entire thoroughness along with the summaries are all outstanding - the very best I have seen.